Communication has been very important in human life since the earlier days. With the development of the different technology, the means of communication has also been easier and convenient to the people of fall over the world. These days we can talk to our friends and family all over the world. The new technology of today’s includes different means of communication like email, internet, telephone. Mobiles and many other social networking sites and applications like Viber, Skype, WhatsApp, IMO and many more. Many of the android apps work with the help of internet or mobile data. To get either mobile data or internet we need to recharge our mobile network or internet service provider on the regular basis. In the context of Nepal, we have two large network service providers i.e. NTC and Ncell. NTC is the network provider which is under the government of Nepal and has provided various services to their SIM users. NTC is also considered as one of the leading communication providers of Nepal. There are many people all over Nepal who are the customer of NTC network and depend on it for the communication. Now when we have a SIM card we also need to recharge our mobile phone for the up and running it properly all the time. As the mobile is the means of communication and is used in the emergency cases it should always be loaded with the money so you can use it in the time of need. As we need to recharge the phone we need to know the different means of recharge method so we can use any one of it whenever necessary. There is a different way to recharge our mobile phone. We use either of the option to recharge our mobile depending on the network that we are using. 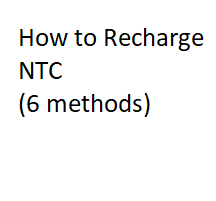 Most of the ways of recharging are similarly in both NTC and Ncell but very may vary. Lets discussed about the way of recharging the number of network of Nepal NTC in various ways. The very common way of recharging the mobile phone is using the recharge card. Today many people find recharging their mobile phone using recharge card easy way. It seems easy to as we can easily get the recharge card in the market. All we need to do is buy the recharge cards from the market in any shop and recharge it in your mobile. In the market, we get the recharge card of NTC starting from Rs. 50 and goes high. We also get the card of Rs. 100, 500, and 1000. If you are recharging your mobile with the recharge card than you should at least recharge Rs. 50 at a time. To recharge NTC with the recharge card you need to press *412* pin number#. Similarly, you can also recharge by dialing in the 1412 and following the instruction that is provided by the system or one of the customer representatives. Even though you find this way easy and convenient one there are different problem in this way of recharging your phone. Well the major problem is some number may wipe out while scratching the card so will have problem in recharging it. In the same way it is not sure the recharge card are available in the market wherever we go. In the remote area there may be the shortage of the recharge card at the time of emergencies. This is the other way of recharging your mobile phone. As it is pin less there is no more hassle likes that of the recharge card. This system of recharging is available with the NTC network. In MPOS system of recharging the mobile we do not have to get the recharge card and scratch it so many people prefer online recharge rather than using recharge card. This MPOS system is not beneficial for the mobile recharge but also used these days for paying our internet bill, electricity bill, water bill and so on. Online payment from the third party like Esewa, ipay pay bill, hello paisa. We know that everyone who is the customer of Ncell or NTC are expert in using the online payment system on their own. But they also want to use the easy way of recharging their mobile from the place where they are at the moment. Sometimes due to various reason, it is not possible for us to get the recharge card at that moment, in that case, the online top-up system with the third party comes in handy. There are different ways of recharging the mobile using the third party recharge system like Esewa, hello paisa and many more. Using this facility we can get the balance sitting in our home just with one call to the service provider. You need the login detail or MPIN for the smart apps at first. After we get the login detail or MPIN we can go to the apps that is launched by the respective bank or the third party application. Once we get into the app of the bank we can choose the option for the service that we want to get. For instance, is it mobile top up or any other operator recharge services according to our need. Then we need to enter the mobile number that we need to recharge and the amount that we want to get in the mobile. Once the process is done then you are asked to enter the MPIN number if you are using the mobile banking or SMS banking. Once we provide the MPIN number soon you will get the recharge successful notification via SMS. Some of the apps are like NTCPro, NTC easy phone app, recharge card scanner for both NTC and Ncell, Nepali Telecom app, and so on. First of all we need to login in to the third party or bank payment portals. Once we login we can select the option of mobile recharge and the network provider like NTC , Ncell. After that we need to enter the amount that we want to recharge. Then, soon you will get the notification of being the recharge successful. In the same way we can also get balance transfer from one mobile number to another within the same network like from NTC prepaid to NTC prepaid. This is an easy means of getting recharge as our family member and the relatives or friend anyone can transfer the balance from one mobile to another. It comes in handy when there is a shortage of shortage of the recharge card or sometimes when you really need the balance and you are out without your wallet. To get balance transfer from one mobile to another we just need to follow certain steps both in NTC and Ncell. To transfer a balance from one mobile to another in NTC these days we need to dial *422* security code of your sim *mobile number *Rs#. Note: Here, security code means your mobile security code which you can get from the NTC office if you don’t have any. Mobile number is the number of your friends or family whom you want to send the balance. Rs. : It’s the amount in Rs. and not in Paisa. For example: if you want to transfer Rs. 10 then you don’t have to dial 10000 Paisa instead you can just enter 10. This service is reopening by the NTC and using this facility one can transfer balance 5 times in a day. The lowest amount that you can transfer is Rs. 10 and the highest amount is Rs. 100 only. This facility can be used to transfer the balance from prepaid postpaid or CDMA. Like NTC Ncell mobile and SIM also can be recharged in the different ways. 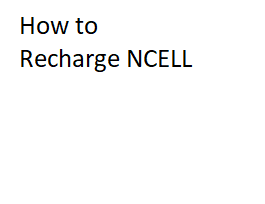 More or less the way of recharging the Ncell mobile is also same as that of the NTC mobile. Even I the Ncell we get recharge card of various credit ranges like Rs. 50, 100, 200, 500 and 1000. Recharging the mobile phone is more or less same process for both NTC and Ncell. Some of the step while using the bank account or online system may differ otherwise it is pretty much same as we get recharge card in Ncell. In the same way, we can also get the balance in our mobile by using the different option of recharging like that of NTC online recharge system, using the service that is provided by the third part like Esewa. In the same way, we also use the mobile app and other banking apps to recharge our mobile phone. In case of recharging the Ncell by using the online or through bank card is a bit different than that of other network systems. To get the recharge in Ncell through a bank account or for online we need to have either debit or credit or MasterCard or Visa card. If we have the bank card then we can visit the Ncell portal (https://payment.ncell.axiata.com/) or use Ncell official app. Once we get into the Ncell portal we need to enter the mobile number and select the balance amount that you want to get as the balance by recharging through the bank card. Then you need to click on the next option and you will be asked to enter the bank card number and other detail so the recharge can be done through the card. Note: Ncell also has done the partnership with the different bank one of which is Nabil so whenever we visit the Ncell portal we see the logo of the Nabil bank while entering the card detail. This is the facility that is provided by the Ncell network to its customer so they can be in contact with their nearest and the dearest one any time. In case of emergency, we can sometimes can ask for the help from our friends and family member if we don’t have balance and there is no way you can get the recharge card too. In Ncell, there is a certain amount that can be transfer and limited times only. Well, we can transfer at least Rs. 10 and maximum Rs. 200 at a time. We can transfer up to 3 times in a day and the service that is included in using this services is Rs. 1.25 (inclusive of taxes). In Ncell we can use this service to transfer the balance from Ncell to Ncell prepaid users only. List of NTC Services – How to Activate NTC Services?